Talk about a rabid fan! The Walking Dead star Norman Reedus was reportedly bitten by a female superfan at a zombie convention, according to TMZ. The incident appears to have taken place at the Walker Stalker Con, a zombie, horror and sci-fi fan convention in New Jersey, where Reedus was a guest this weekend. The woman reportedly bit Reedus, 46, on his chest, but TMZ reports the actor declined to press charges and didn’t need medical attention as he wasn’t injured. 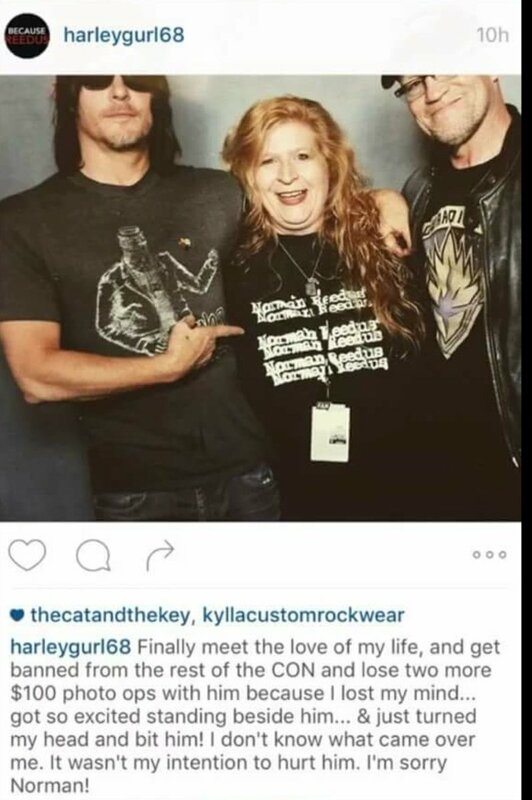 According to TMZ, the woman has been banned from all future Walker Stalker conventions and other sponsored events where Reedus is present, and a screenshot of an Instagram picture apparently posted by the biter seems to confirm that information. “Um please don’t,” he captioned the post. The Walking Dead returns to AMC on Feb. 16.